Moderately weak with weeping habit. Susceptible to mildew, moderately resistant to scab. Granny Smith, Golden Delicious, Delicious. Round to flat conical, medium, can be small. Bright red with a stripe over 50–75% of surface. Crisp flesh, sweet and juicy with a tang. End of February, early March. Moderate; can develop scald and Jonathan spot. Red Jonathan - Sport of Jonathan. 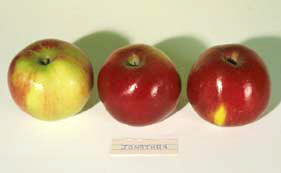 Similar to ordinary Jonathan, solid red up to 100% of surface; not quite as good a flavour as ordinary Jonathan.